THE Six Days Cycle Race you have come to see will finish at 11.5 p.m. next Saturday. It will then have lasted for exactly 143 hours. What will have happened during that time? The teams each consist of two riders, one of whom must be on the track throughout the race. They may, however, relieve each other at will. There are 12 teams - 24 riders - engaged in the race. The object of each team is to cover the greatest distance in the week. At first glance this should seem to be a fairly simple matter. At the end of 143 hours one would expect there to be many miles separating the leaders from the tail. In reality, however, it is nearly impossible for one team to draw away from the field, so well are they watched by their competitors. To gain a lead the rider will start what is technically known as a "jam." A jam is the real fun and excitement of the Six Days Cycle Race - it may last for five minutes or for five hours. That is the beauty of it. It will usually start when one wily rider finds that he has momentarily escaped the attention of the others, and away he streaks, pedalling like mad. By the time the others have realised the danger he is perhaps half a lap ahead - and then pandemonium breaks loose! The riders who are resting are hastily summoned from their bunks. Some of them may have been shaving and come out with their faces covered with lather, others were snatching a hasty meal and start with their mouths crammed full. They are pushed off to relieve their tired team-mates. Suddenly the track seems to be literally alive with riders, some -travelling all out, others pedalling slowly round. To really enjoy this Six Days Race one must be able to follow the general idea of the "jam." Remember, one rider of each team must always be in the race, but can be relieved by his team-mate at any time. In a jam, therefore, one will find 12 riders (if there are 12 teams still left in the race) scorching round the track, usually closely bunched together, one behind the other, in order to take advantage of the slipstream created by the one in front. The other riders will be pedalling slowly round well up on the outside of the track. Every three or four laps you will see one of these 12 start to gather speed, and as his team-mate flashes past he will hand-swing his relief and they will change places in the race, the relief pedalling for all he is worth in order not to lose ground, the other cycling slowly round the outside recovering his breath. After a little experience the spectator can soon get the hang of these change-overs or pick-ups, especially as both riders in each team are similarly dressed. The object of a "jam" is to gain a lap on the field. By this time the rider who broke away at the start may be nearly on the tail of the last rider, and the excitement of the crowd will be terrific, as he gradually creeps tip inch by inch. "He's there, no he isn't - he's done it!" and you will hear the announcer say "So-and-so has gained a lap." But does the excitement cease? It does not! By this time perhaps half a dozen other teams have broken away from the field and are trying like mad to get that lost lap back, and so it may go on for hours - the lead changing and changing every few minutes, until the "jam" comes to an end just as suddenly as it started, leaving the harassed officials to tot tip the final reckoning. To help you to follow a "jam" and thereby more fully enjoy your fun, try at first to concentrate on two riders only - the one in front and the one in the rear (that is to say, the one the leader is trying to overtake in order to gain a lap). Do not bother about the others. When the leader does pass the rearmost let your eye quickly pick up the next one in front, who now becomes the new leader, and after you have been doing this for days and nights on end you will no doubt say - like the commentator - "We do have fun!" THIS year's Wembley Six-Days race is different from the previous two “races to nowhere". Different in several respects. 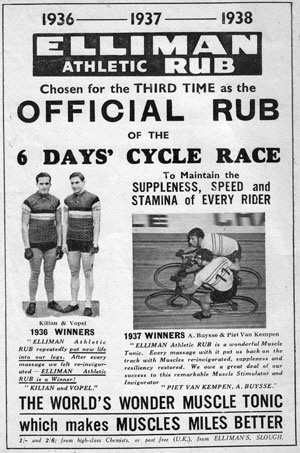 Firstly because there are no English riders, (although Joe Buckley of Australia provides an Empire interest), secondly because the national Press has at last recognised the sporting appeal of a six days' race, and has given it adequate advance publicity, and lastly, and most important difference of all, in so far as the spectator is concerned, "sling” changing is allowed. “Sling " changing introduces a new thrill. Sling changes were occasionally seen last year, but the referee, in accordance with the rules which forbade them, penalised the teams using sling changes, and soon discouraged them. This year the promoters are allowing sling changes, because every man in the race is an expert six-day rider, and sling changes can only be used by experts, in the company of experts. What is a sling change? you might ask. First let me explain, to those who are making their first visit to a Six, the object of changes. The two riders who form a team are allowed to relay each other at will. A relay can be performed by the simple act of running alongside and touching the relieving rider on the shoulder. But what a waste of energy! One rider has to exert himself to the utmost in order to sprint into racing speed, while the other has to back pedal to slow up and get out of the race. To obviate this waste of energy, what is now known as the "classic" change was introduced. The rider about to take over (the relieving rider) runs alongside his team-mate, on the outside, and with his left hand pushes his partner vigorously on the buttocks. In this way he imparts all his momentum to his team-mate, and, with the one push of his hand, gives him a flying start, at the same time bringing himself almost to a standstill. In America they developed a slightly different type of change-over, called the “sower". The name comes from the arm action involved, which closely resembles the overarm swing of the old-fashioned sower of seeds. The about-to-be-relieved rider runs, alongside his team-mate, on the inside (and not on the outside, as in the “classic" change) and with his right hand takes a firm grip on his partner's racing shorts. Then, with an overhand swing, he hurls him forward at full speed. The result is the same as in the "classic” change. And now for the latest, and most exciting, technique of changing over - the "sling." This is a method that calls for precision timing and perfect co-ordination between the two riders. The slightest misjudgment - and a crash is inevitable. Here's how it is done. The rider who is about to go on duty warms up the pace to about 20 m.p.h. His team-mate overtakes him on the inside, holding out his right hand. The relieving rider seizes this with his own left hand. As the inside man is travelling at nearly double the speed of his partner, naturally, in a split second, the two riders will be at arms' length. Then, at the exact moment, the inside rider gives a terrific pull with his aria, until the two are level. Again timing it exactly, the pull is exchanged for a push, and the relieving rider is sent swinging off along the track. In the space of a second the pace of the two riders has been reversed. It is, without doubt, the perfect relay. But, like most things perfect, it takes hours of constant practice, and most promoters, unless they are very sure of their riders, forbid it. If the very names of the riders alone did not proclaim it then the decision by the Wembley promoter to allow sling changing is a guarantee of the excellence of this year's field. The London Six Days Race is run under the control of the National Cyclists' Union, the governing body of Cycle Racing in Great Britain, and affiliated with the Union Cycliste Internationale, governing body of Cycle Racing throughout the world. All riders participating must hold a licence recognised by the Union Cycliste Internationale and must present same for inspection by the officials of the National Cyclists' Union. 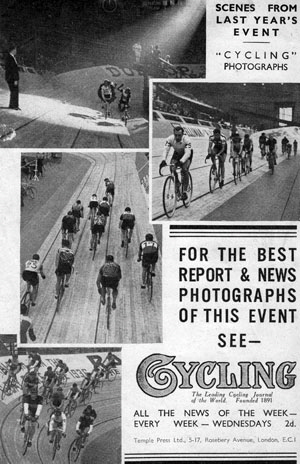 All officials supervising the contest are approved by the N.C.U., and any fines as hereinafter mentioned that may be imposed shall be without prejudice to any further steps which may be taken by the National Cyclists' Union, who have the power to take such disciplinary action by the way of fine or suspension as may be considered advisable. The race shall last 143 hours, commencing at 5 minutes after midnight Sunday, May 1-2, 1938, and terminating at 11.5 Saturday, May 7. The whole of the race must be covered on bicycles, riders not being allowed to cover any part of the distance on foot, even if the bicycle is wheeled or carried. Riders must at all times ride on the board track and not on the flat of the floor. The riders shall ride in teams of two, and must compete without ceasing, one of the riders of each team being always on the track, except in cases of force majeure, of which the referee shall be the sole judge. The two partners of a team may relieve each other at will, except for the first two miles (which, except in case of accident, must be completed by only one of the team), and as specified below. The winners of the race will be the team with the greatest mileage at the expiration of the 143 hours. In the event of a tie, the decision will go to the team with the greatest number of points gained in the daily sprints, provided that the mileage of the teams is equal. Every day, as scheduled elsewhere, sprints will be held, each over a distance of 10 laps. Irrespective of any laps gained or lost by a team, points will be awarded to the first four men over the line on completing each sprint-6 to the first, 4 to the second, 2 to the third, and 1 to the fourth. The commencement of a series of sprints will be signalled by a pistol shot at the commencement, with a bell rung at the beginning of the last lap. In a series of sprints, each sprint will follow on immediately, so that as the riders cross the tine for the conclusion of one sprint, they will be commencing the next. On the sixth and last day the scoring of points shall be for the winners 12, for the second 4, for the third 2, for the fourth 1. At 10 p.m. on the final day, i.e., commencing the final hour, there will be a sprint every ten laps until the finish of the race, scoring 72 points for the winner, 4 for the second, 2 for the third, and 1 for the fourth. Time Trials by individual riders and teams will be carried out during the course of the Race, and points according to the results of these Time Trials will be allotted to each team. A schedule of points for the various times recorded is set out on the official points scores page of this programme. These Time Trials will be made at the discretion of the Principal Referee and his assistants, and their decision as to points scored will be final. Partners in a team may not relay each other after the commencement of the last lap of each sprint, i.e., no changing is permitted after the sounding of the bell. At the sounding of the bell for each sprint the rider in the lead shall keep to the pole line. The finish of the last sprint of this series, which is also the finish of the race, will be when the riders cross the line on completion of a 10-lap sprint which has commenced before 11.01 p.m. A series of pistol shots will signal the termination of the race. The referee has the right to postpone the firing of the final pistol that marks the end of the race if a breakaway is in progress that will, in his opinion, materially affect the result of the race, and the finish of the race will be at the termination of the breakaway. The same ruling applies to all sprint series. Any rider desiring to protest against any decision of the officials shall lodge such protest in writing with the referee within one hour of the occurrence. The two riders of the same team must wear the same colours throughout the race, both on their racing jerseys and on any sweaters worn. These colours must be as stated on the programme. All machines must be subjected to the scrutiny of the referee before the commencement of the race. All handlebar ends and extension ends must be plugged and taped ; all projections likely to endanger the other riders are forbidden ; freewheels and brakes are forbidden. All riders must present themselves, without exception, on the track at 9 p.m. Sunday, April 30, for presentation to the public. In the event of a serious crash in the first two miles, the Referee may declare a false start. After the first two miles, riders of the same team may relieve each other at will, provided that one rider is always on the track, except during the last lap of each sprint. Mounting and dismounting must be made at the inside edge of the track. A rider taking over must mount immediately in front of his cabin, and similarly a rider relieved must dismount in front of his cabin. A change-over shall only be valid when the relieving rider is level with the relieved rider, and the referee shall be the sole judge of the validity of all such change-overs. A relieved rider must keep to his line and not swing across or up the track until an opportunity presents itself. During a jam a rider must, on being relieved by his partner, take the first safe opportunity to reach the upper portion of the track above the blue line, and there ride until lie is about to relieve his partner. All change-overs shall be made on or above the red line. Hand swinging in the change-over or pickup is permitted. Riders who make incorrect changes will be liable as follows, subject at all times to the discretion of the referee. First fault : warning ; 2nd fault : fine of £1 ; 3rd fault : fine of £1 and loss of one lap. In the event of further faults disciplinary action is at the discretion of the referee. If a team by means of incorrect changes gains a lap, or being one lap behind regains a lap, then, apart from anything contained in the foregoing, they shall, at the discretion of the referee, lose this lap. The term crashes covers (a) punctures, (b) broken or unshipped chains, (c) any other accident, rendering the machine out of action, provided that it is brought to the attention of the referee. In any case, a rider meeting with an accident must immediately raise his arm as a signal. Any rider who falls through carelessness, or voluntarily, or from tiredness, cannot benefit from the provisions below. In the case of a crash outside the control of the riders, the rider or riders concerned must immediately set off on a spare machine, or be relieved by his or their partners. If either of the team takes their place in the group before having lost more than 10 laps, no loss of laps will be counted against them. Laps lost after the first 10 will be recorded against them. If a rider crashes when he is ahead of the group but not a complete lap ahead, then, on rejoining within the minimum 10 laps, he shall be considered to have lost the lead. The race shall never be stopped for accidents, that is to say, when one or several riders fall, the others shall continue. At the discretion of the referee the bell may be sounded five times, to signify that no laps may be gained or lost until the field is complete, when the bell will be sounded three times. During this period between bells, no rider may leave the track or stop riding. In the event of the track being rendered momentarily impassable, the referee has the right to stop or neutralise the race for the time necessary to restart the race in perfect order. The neutralisation will be signalled by ringing the bell several times. If a rider crashes when the field is divided into groups, then the rider, once remounted or relieved within the required 10 laps, will be classified according to the position of the group of which he formed part. That is, if his group has been, lapped, then he will be counted as lapped. If his group has rejoined, he will be counted as rejoined. If a rider gets away from the field and gains a lap, without there being any effort by the field to stop him, the lap shall be granted if there has been no voluntary or involuntary obstruction to the group's efforts. The lap so gained shall be refused if there has been any manifest obstruction preventing one or several riders giving chase to the fugitive. Further, the riders convicted of obstruction shall be severely warned or penalised 1 lap at the discretion of the referee, and for a second offence be fined ~5 or penalised 2 laps. When a rider breaks away, the rider then in the lead shall give chase for at least one lap, or be liable to the penalties herein mentioned. Any rider who allows himself to be outdistanced to wait for a rider or group of riders, for the purpose of pacing, whether to help in gaining a lap or rejoining the field, shall, at the discretion of the referee, be penalised I lap. If this offence be repeated by the same rider, the referee may exclude him from the race. Any rider or riders being so fraudulently paced shall be refused the lap which may have been gained thus. Any rider who intentionally causes a rider or riders to crash shall be excluded from the race. If a rider, victim of an accident, is obviously not able to continue, and his team-mate is in a like state, then the referee may allow the team time out, expressed in minutes, to resume. This time once passed all laps lost by the team will be counted. Any rider who, in the opinion of the referee, is incapable of continuing the race, shall be withdrawn and shall retire from the race. Also any team more than ten laps behind the leaders may be withdrawn by the referee. All the normal rules of the National Cyclists Union as applicable to track racing shall be enforced as usual. If one man of a team abandons, his team-mate shall be authorised to form a new team with a member of another team in like case. The new team formed shall continue, penalised by one lap, plus the laps lost by whichever of the former teams had lost the least. The new team shall count in its favour the number of points of whichever of the teams had the higher total. Any rider abandoned by his team-mate and desiring a new partner under the above conditions must inform the referee and form a new team within eight hours, provided the following conditions are observed. (a) The abandoning rider must sign a definite statement to the effect that he does not wish to continue, on which will be stated the hour at which he abandons, and which shall remain with the referee. (b) From this moment the rider remaining in the race must continue without dismounting until half an hour is passed. At this moment he may dismount for half an hour, then remount and take his place in the group for another half an hour, and so on, riding for thirty minutes in each hour of the race. The referee has the right to modify this rule, provided always that the periods of presence and absence are equal in time. The rider will be liable for all laps gained or lost by him whilst riding, but whilst resting he will be in the same relative position to the leaders. (c) If at the end of eight hours the rider, is still without a team-mate, he may demand a prolongation of another four hours, but after this is only at the discretion of the referee. (d) After the 140th hour, only complete teams will be allowed to remain in the race. If any of the public wish to offer primes to the riders, they must communicate with the nearest " Primes Steward," who will put them in touch with the referee. These primes, in cash or kind, may be offered for the normal daily sprints, or for any special sprints extra to these at the wish of the donor, or offered to any team gaining a lap within a certain time or under any reasonable conditions imposed by the donor, subject always to the absolute discretion of the referee. The referee is in sole charge of the race, although lie may delegate his authority to any approved person during his absence. The referee's decision is final on all points. In the event of any occasion arising which is not provided for in the above rules, the referee shall add or modify these rules to meet the occasion arising, subject to the confirmation of the N.C.U. official representative then acting. By their engagement in this race the riders declare their agreement with and acceptance of all these rules. 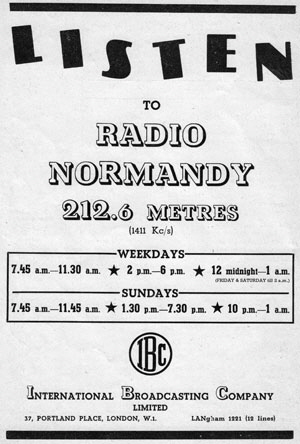 Any protests which they wish to make against any decisions during the race must be made in writing and handed to the referee within one hour. No rider may be on the track more than 12 hours in each 24. Any rider guilty of foul riding, or ungentlemanly conduct, dress or language, shall at the discretion of the referee, be disqualified and excluded from the race. A rider shall be held, responsible for the actions of his manager and/or trainer.